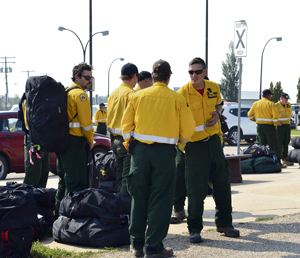 Wildfire fighters from Saskatchewan returned from fighting fires in BC Tuesday (Peter Lozinski/Daily Herald). Owen Price has been fighting wildfires for 30 years. Price works at the Provincial Wildfire Centre north of Prince Albert. But for the past 15 days, he’s been in BC, looking after Saskatchewan’s wildfire crews and ensuring they’re being taken care of while they’re out of province. He, along with 30 other people, returned home Tuesday after days helping crews in BC battle fires across the province. “The environmental conditions in BC — I’ve never seen smoke conditions that bad in all my 30 years,” he said. Price and the rest of the wildfire crew left August 5, and touched down at the Prince Albert airport yesterday, shortly before 3 p.m. The group included wildfire crewmembers, logistics and supervisory staff. In all, Saskatchewan sent about 59 firefighters and 29 overhead staff in total. The province has 38 firefighters and 18 staff still in BC, and they will be there for another week and a half. An air skimmer group is also working in Montana and another aerial group in Oregon. Saskatchewan is currently assessing whether more can be spared to head to BC as that province continues to face one of its worst wildfire seasons ever. Over 600,000 hectares have burned so far. 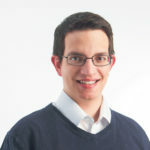 Josh Lees is no stranger to fighting tough fires. While he is currently stationed in Hudson Bay, Sask., Lees spent last year, his first as a wildland firefighter, in BC. The trip he returned from Tuesday was the first time he’d been sent out of province to lend a hand. Lees said the fire he was assigned to started at 5,000 hectares when he arrived but had grown to about 80,000 hectares, or 800 square kilometres, by the time he’d left. In situations such as that, Lees said, it’s all about the training. “When there are spot fires, or instants you have to hurry up and catch the fire, your training definitely kicks in,” he said. Lee–Ann McTaggart had a much different experience working on the west coast. She spent 13 days at Telegraph Creek, three and a half hours south of the Yukon. She didn’t see much fire but said there was a lot of smoke. Part of the challenge of logistics is organizing so many firefighters from so many parts of the world. “I met people from New Zealand, Yukon, Australia — everywhere. I met people from BC as well,” she said. Working alongside firefighters of such varied backgrounds is beneficial to everyone, said Steve Roberts, Saskatchewan’s executive director of wildfire management. Last year, Saskatchewan sent crews out near the beginning of the year and battled an active fire season later into the fall. This year, though, the province started out wildfire season with a handful of more serious incidents, but fire activity has since calmed down, and Saskatchewan is on pace for a more average year. “As soon as the weather cooperated and it cooled down in the north, we ‘ve been helping from east to west,” Roberts said. The number of crews sent out this year is high, Roberts said. But the good news is the agreements are reciprocal. Provinces help each other out in times of need, on a cost-recovery basis. The 2015 wildfire season in Saskatchewan was a good example of a time this province needed that help, Roberts said. “In 2015, we had crews from across Canada, we had crews from across Canada, we had aircraft from across Canada and the United States as well as the military,” he said. The crews themselves don’t mind heading out of province to help. Price has done so many times. And even though this was the first out-of-province mission for both Lees and McTaggart, both said they would do it again. “In a heartbeat,” Lees said when asked whether he would say yes if he was asked to fight fires in another province.